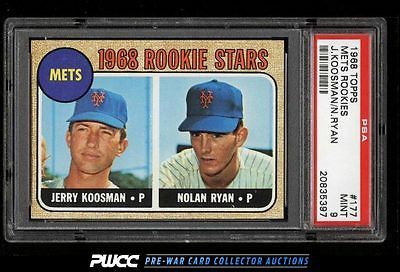 A world class, incredibly important card from the 1960s and the lynchpin production for the '68 Topps set. Nolan Ryan has the illustrious distinction of pitching compettiively in 4 different decades, amazing records which will never be touched. Offered here is one of the very finest examples in the world, boasting flawless surfaces, four very sharp corners, and pack fresh edges throughout. Everything is where it should be in upholding the lofty grade. Part of an extraordinary '68 Topps set break on the auction block this month. Virtually every card is assessed by PSA as MINT to GEM MINT with many being among the finest examples in the hobby. One of nearly 17,000 cards, lots, and sets up for bid in our 8th Auction of 2016. Click on the link above to view the other PWCC auction lots.